1Law4All’s inaugural AGM was packed out. Speaking at the waterfront conference venue in Napier on Sunday, newly elected President Dr Tom Johnson, said that minorities do tyranny far better than any democratic majority has ever done, so how could race-based privilege and power ever have a good outcome for New Zealand? 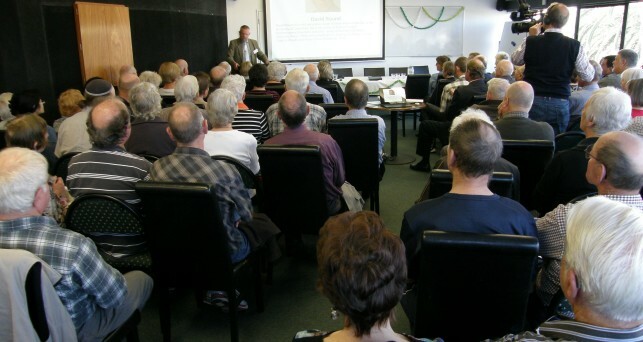 Members and friends were held riveted by guest speaker David Round, Senior Law Lecturer at Canterbury University. He comprehensively explained why the departure from democracy’s basic tenets of absolute legal equality, one person, one vote and no tax without elected representation was a “really stupid idea”. “After nearly two centuries of inter-marriage, separating us legally on race-based grounds is totally ludicrous. For example, Ngai Tahu has tribal members with only 1/256th Ngai Tahu blood. How could the genetic inheritance of one great-great-great-great-great-great grandparent outweigh the blood of the 255 other great-great-great-great-great-great grandparents?” asked David Round. (Note: His highly entertaining and politically honest performance will be available on YouTube soon). 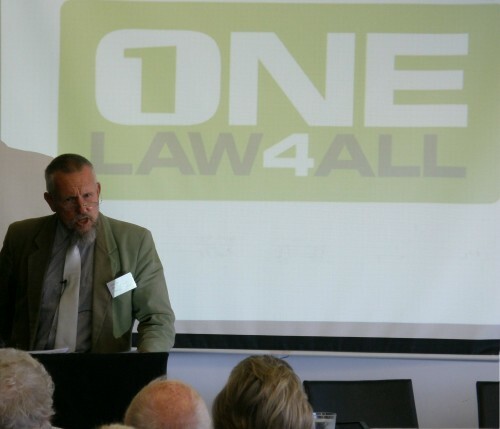 In describing 1Law4All, Dr Johnson explained that the organisation is a grassroots movement of ordinary New Zealanders, united by a concern for the country’s future. There are over 1,200 members nationwide. They come from across the political spectrum – from the Greens to Act – and from Southland to Northland, with particularly strong followings in both the Bay of Plenty and Hawke’s Bay. 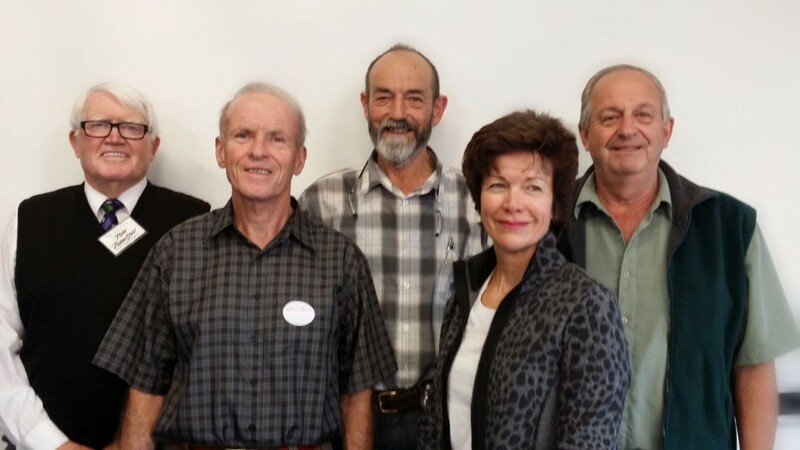 Members present elected a Board of Directors for the forthcoming year. Left-to-right: Dr Tom Johnson, John Bell, Collin Blackman, Fiona MacKenzie, Perry Spiller. “If politicians were truly representing the people, we could simply get on with our lives,” said Dr Johnson. “But we can’t sit back and watch the greedy and self-interested destroy our democracy and entrench corrupt, apartheid policies. “By registering as a political party, we will at very least provide disenfranchised voters with somewhere to put their protest vote on 20th September. …..Thank you Dr Tom Johnson of the “1law4all”….at last some “action’ for the return of DEMOCRACY to the Nation of New Zealand….may the journey be swift…..
It’s great to hear that things are getting started. I’m looking forward to hearing more soon. The best of luck. The gossip is that the Electoral Commission is slogging its way through the 6-plus weeks process of auditing the application. (As much was heard to be said at the AGM.) My guess is that the Electoral Commission will be contacting any number of members to make sure that some of you devious lot weren’t filling in forms for all sorts of pets and people who didn’t know they were about to become 1Law4All members, just to make up the 500 member numbers and avoid Dunne’s Disease! lol we hope not Simon. But yes, it takes 6 to 8 weeks for the Commission to process our application, which has definitely been sent in, and hopefully there won’t be any hold-ups. Now, we sent out that media release to over 150 members of the media last night. So far there has not been a whisper about it that we can see. I suggest that all of you start asking your local papers why they are ignoring us. Start putting the pressure on. To censor what you readers get to see is to behave like pre-war Nazi Germany. It’s simply not good enough. Could not make the meeting due to circumstances beyond my control, but it is very gratifying to see so many like minded people in attendance. But how to attract more attention to the party without having to display the circus that is Mana and Dotcom crap? Well done re the AGM,keep me informed re the Election, I am on the North Shore, Auckland who is your contact here. We have a very Militant Man by the last name of Morehu in Taranaki. He has no interest in the community as a whole and solely wants representation for Te Atiawa without any democratic pledge. I feel he does not represent all his people and certainly not the community. I ask the question……What would happen if you had ten children but continually treated one individual child with extra privileges, perks and options the other kids didn’t get? No doubt there would be a fair bit of resentment from the other kids. Wind the clock forward and see where this will end up……..sad isn’t it! I feel a bit sorry for South African immigrants because they have come to a country which is fast approaching what they left behind. NZ will never get ahead while we keep paying out huge amounts of white taxpayers money for dreamt up past “grievances” which go into “charatible” trusts paying no tax into the system the part breeds enjoy. Equality for all New Zealanders. Wonderful to see the future when this WILL be true. My admiration for the strong, thinking people behind the 1Law4all grass roots party is endless. I am proud to be a member. At last! Something to shout about. I must confess to a cooling off as I was initially doubtful of a party being formed in time for the election, but I will be 100% behind this movement as I was for previous similar issues. Great to hear we’re under way, best of luck to those that have put their names forward it is much appreciated. Let’s spread the word. What a great job all those at the top are doing and great to receive the update emails,every update email I receive brings me hope that us minority will make a difference, and in time our voices will be heard. Only the other night on the news I see another trust has been allowed by our govt to receive funding at a cost to us taxpayers of $30 million,yet another demonstration our New Zealand in its full force of separatism. Anyway I have been side tracked,i will continue to promote our movement…. political party. Could you please let me know who to contact to help this party get known. I am in the Rodney area. Hibiscus Matters news paper is extremely good they are not affiliated to any of the larger papers and there fore are prepared to report news. They where helpful when we were fighting the council over an importatant issue re sale of land. yes yes finally a party worth voting for. Post AGM I have viewed only one minor Press Statement regarding 1Law4All now being a Registered Political Party. No doubt many things are happening in the background but would be great to know something of what is happening or about to happen. I see that the current opportunity is there to promulgate 1Law4All in regards to the judicial unfairness/double standards/special rules for a specific section of NZ society. Other matter of interest of course is if there are any interviews being arranged with Q & A, 20/20, Campbell Live, Laighton sp? Smith NewstalkZB & the like. Something needs to happen soon; I know it’s easy in the background to make comments like this but time is paramount. I haven’t seen or heard of it anywhere and I’ve been keeping a good eye out. Q+A has been mentioned and there is also The Nation on Sunday mornings. We need to get out there and onto these shows. I know it’s hard to get the dreadful media to take note but I do wish they would get off their butts and start reporting everything instead of the same old, same old, or beating up on ridiculous side issues which prove nothing.